Create your community on Map Your City - give your followers better location experiences. So you can sell more stuff, create more foot traffic to your locations & events and collect the intel to make informed decisions. Take your branded Location Marketing Power Tool for a free spin. When you create your community on Map Your City – you are the owner of that community and can invite others to join. 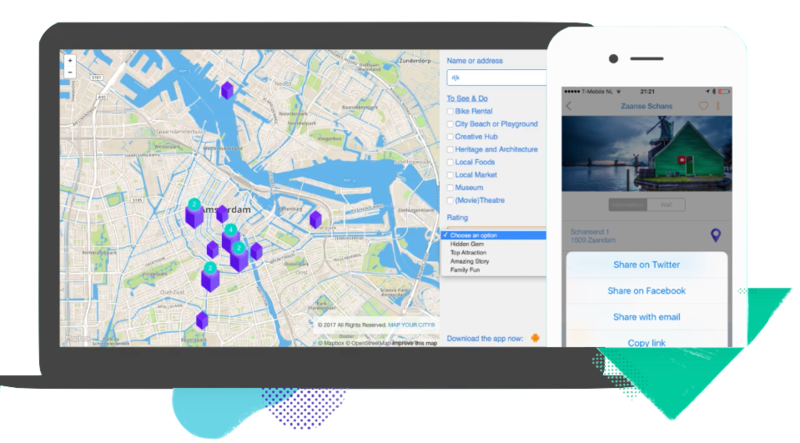 Together you can map, tell stories, promote places and create valuable location experiences for your community’s followers. Our goal is to provide you with the most flexible pricing and features to help you do that successfully. Whatever your goals, we have ways to make it happen. With Map Your City you can create and customize amazing Mobile app experiences, build stunning web Maps and Landing pages, write killer Blogposts and Email campaigns, create Payment options, add Ticketing or Online Reservation Systems and Booking Platforms. Map Your City makes it easy to create location experiences that connect with your audience at the right time and the right place. Increase your outreach even further and integrate your favorite social media, like Facebook, Twitter and Pinterest. Creating a community starts with "Essentials". A flexible pay-as-you-go solution for customer centred businesses and marketing professionals like yourself - working in the travel, experience or creative industry. Essentials is also a perfect fit for small to medium sized Bia's, Destination Marketing Organizations, Tourism Associations and Event Organizations.